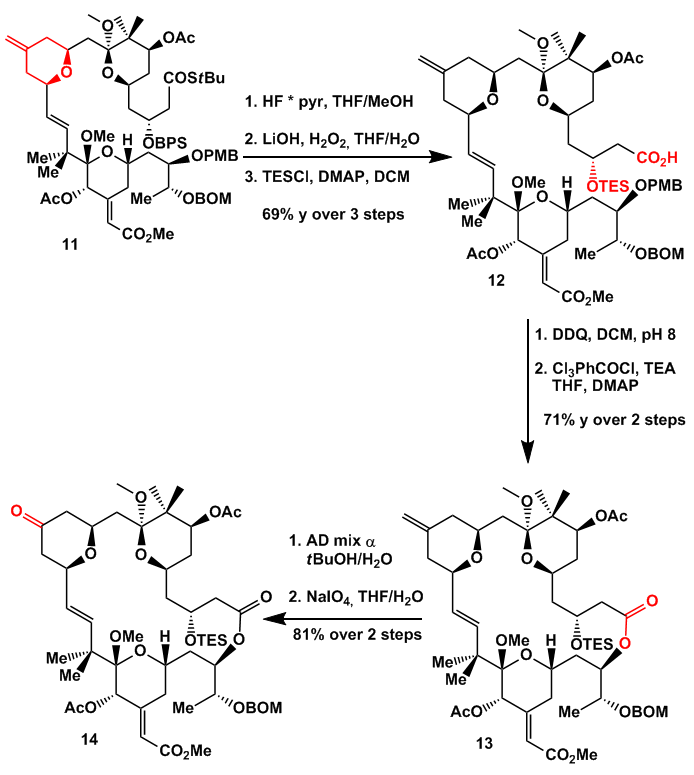 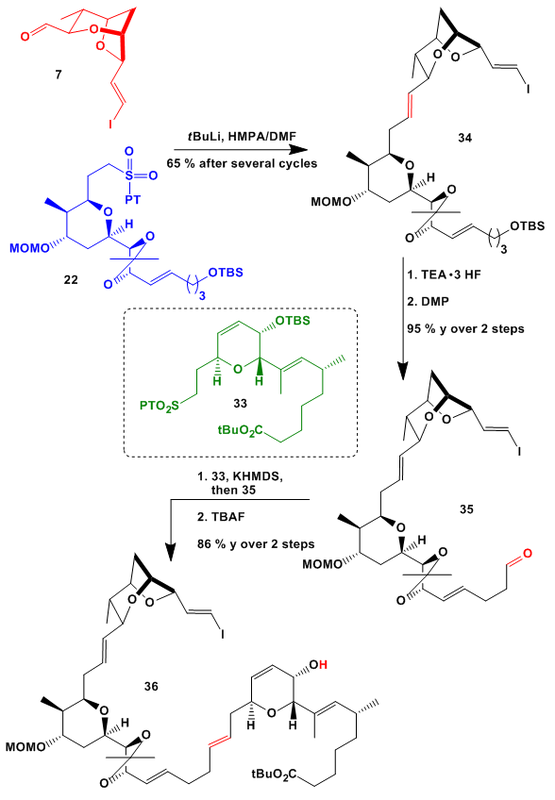 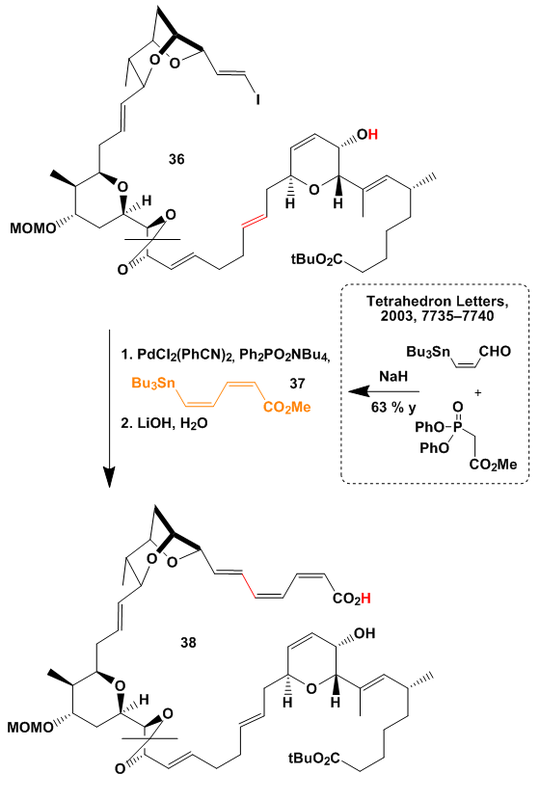 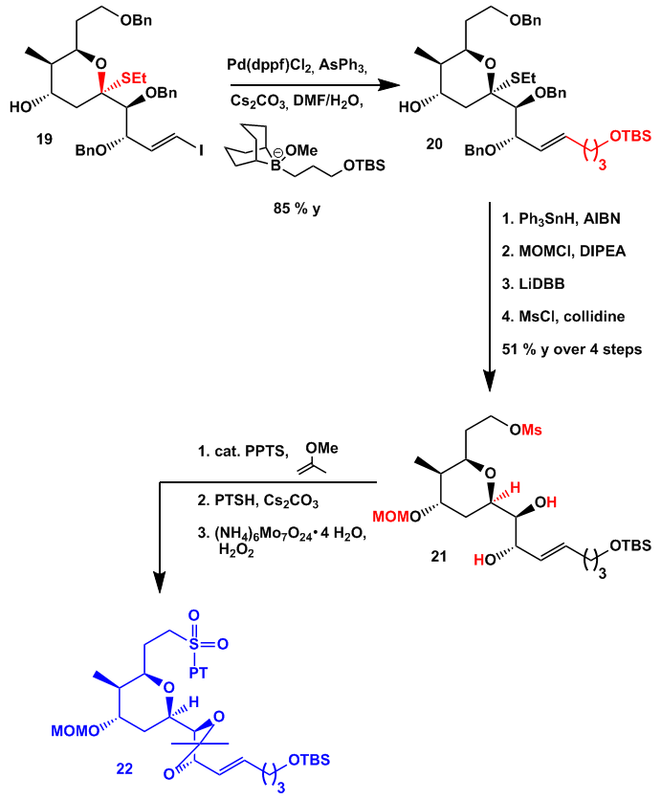 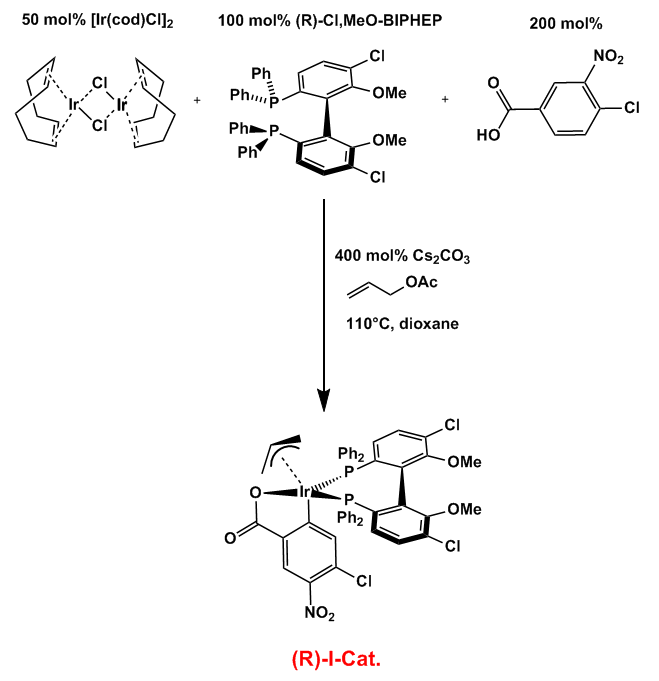 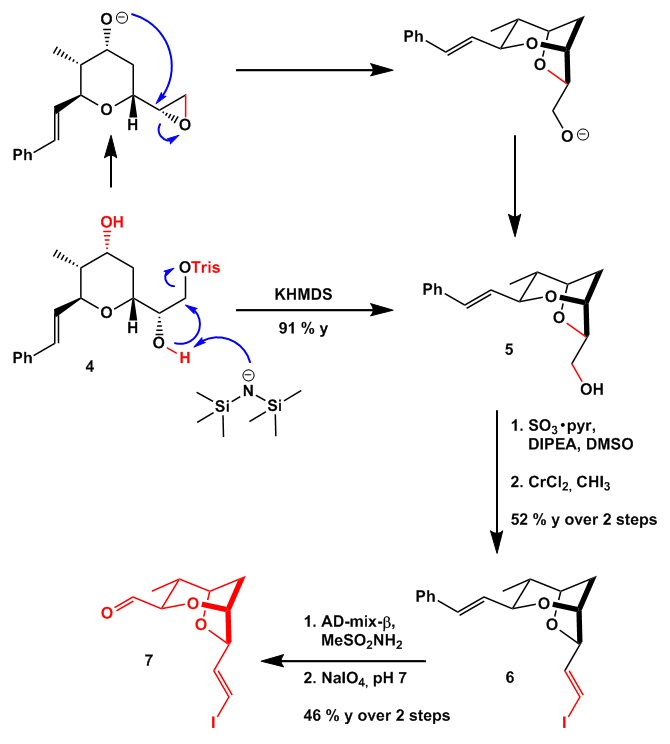 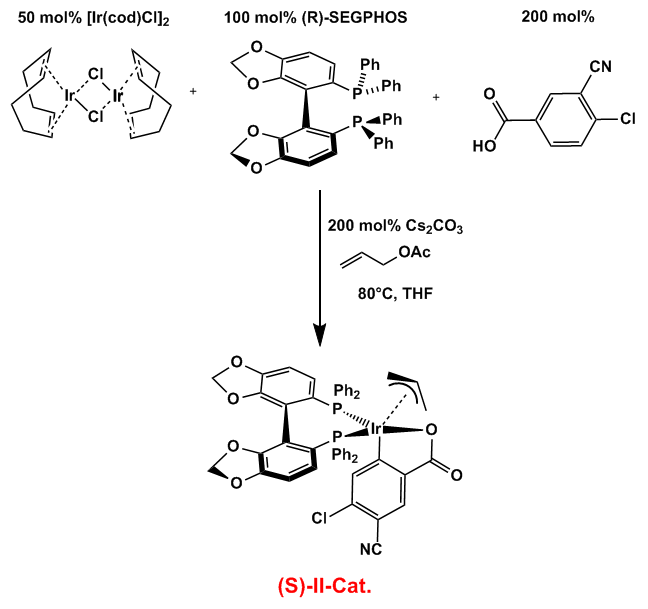 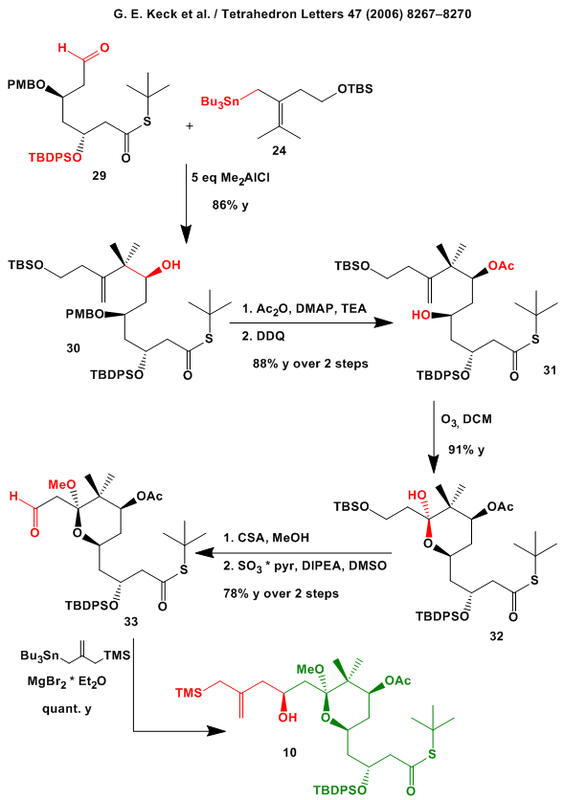 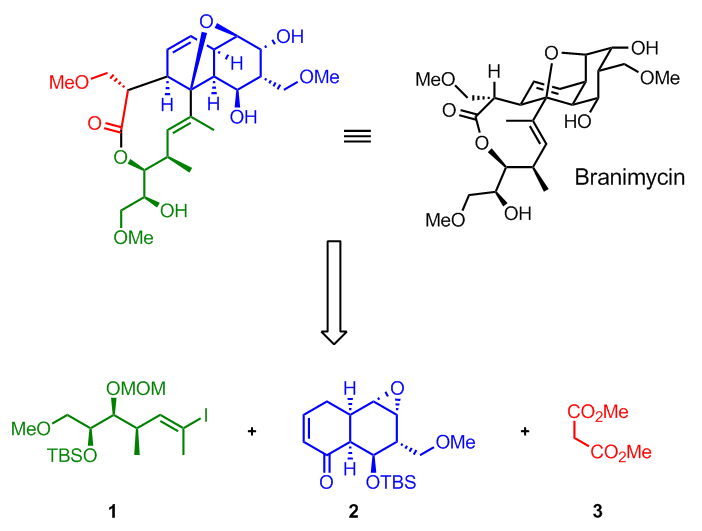 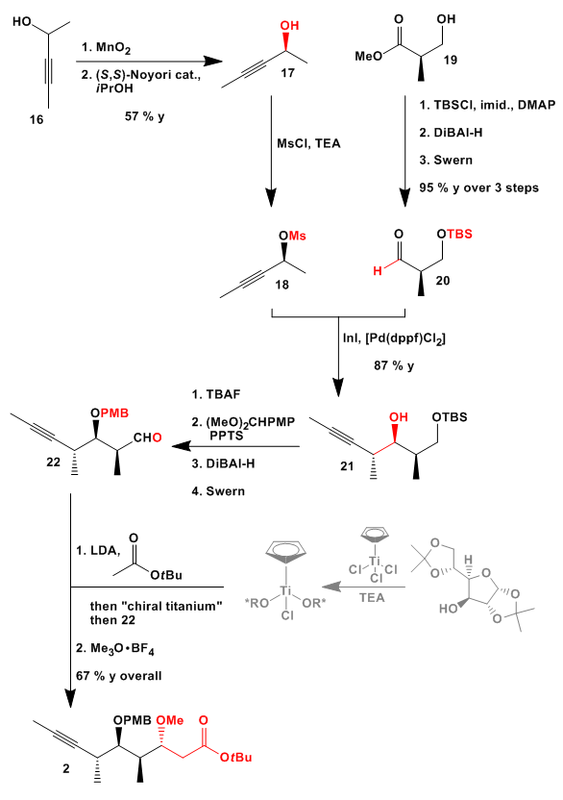 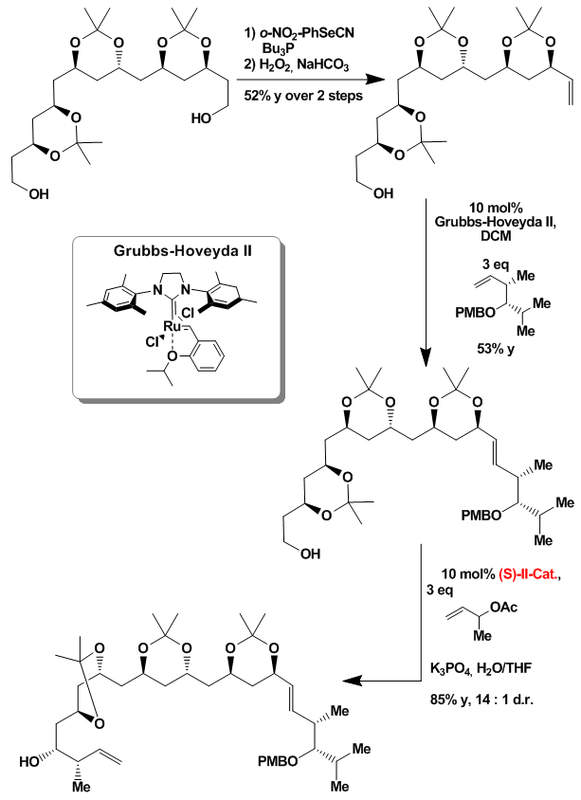 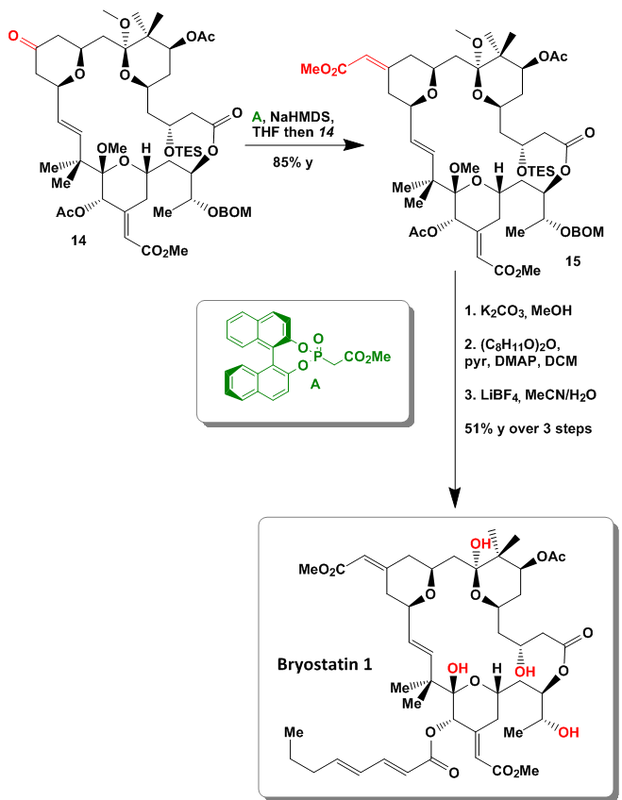 Happy new year everybody… I start this year with a nice synthesis from my university done by a very smart student. 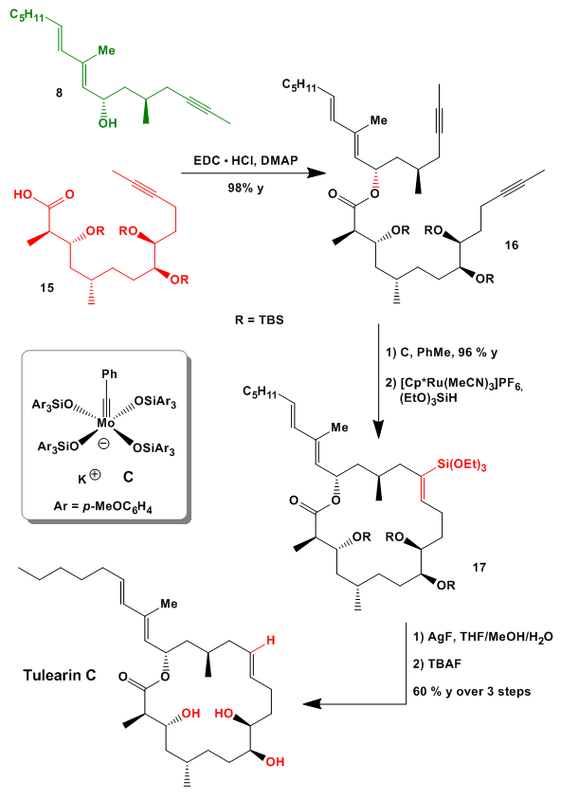 In this paper a lot of cool metal mediated chemistry is employed which reminds me a bit of the work done by the Fürstner group at the MPI. 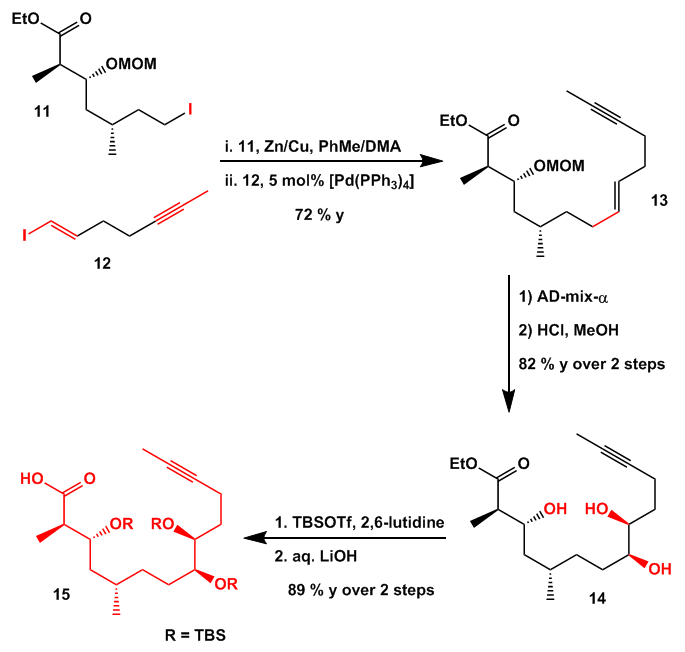 Some methodology needs as usual special attention and will be examined at the end of this short write-up. 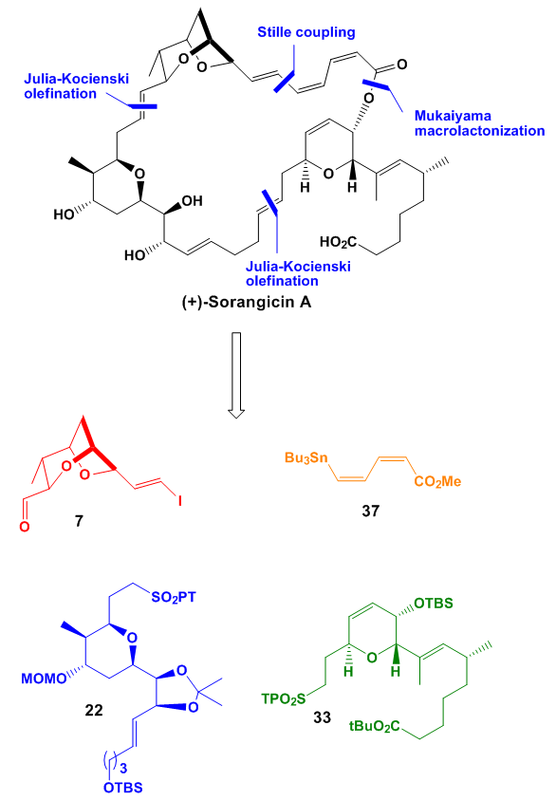 As the title says Carolacton is a potent biofilm inhibitor which is nowadays a very interesting field to establish new drugs and natural products as biofilms play a major role in clinical treatments. 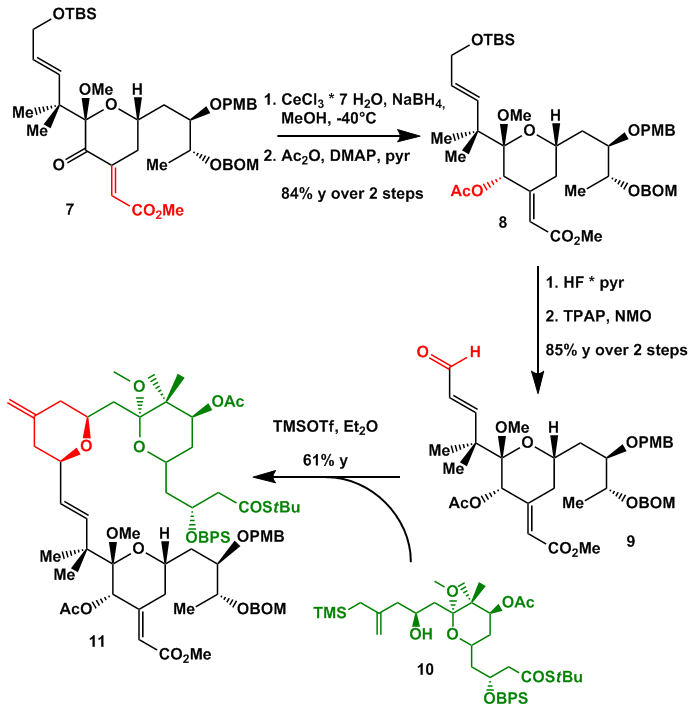 Retrosynthetically Carolacton was divided in two fragments of almost the same complexity. 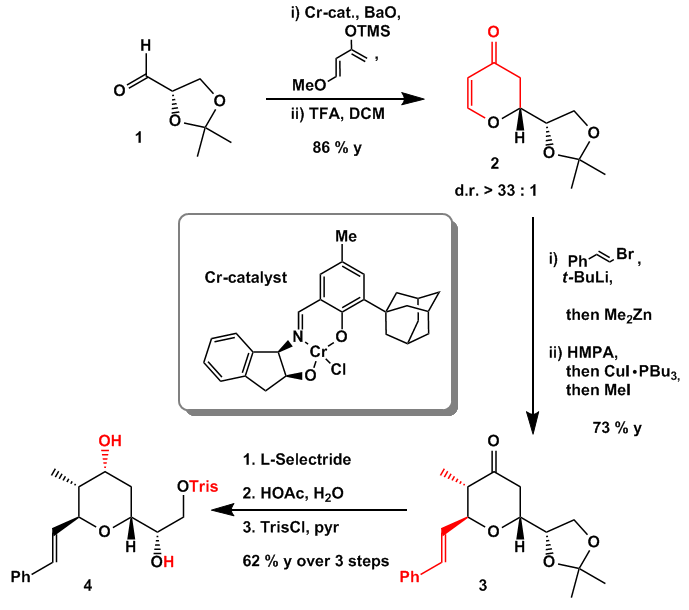 Beside the crucial macrolactonization step the linear precursor was envisaged to be formed by a stereoselective Nozaki-Hiyama-Kishi reaction. 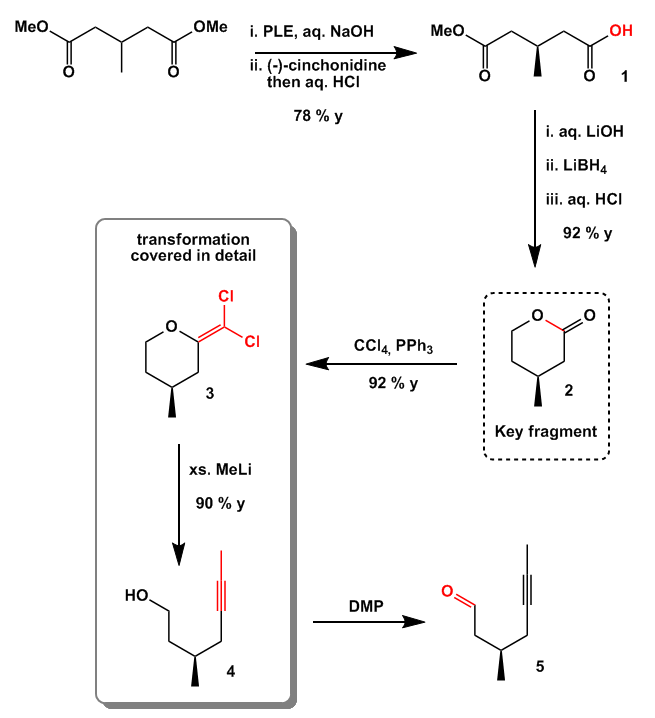 The key steps in the formation of fragment 1 contain an alkyl Negishi coupling and a cool aldol reaction developed by the Ley group. 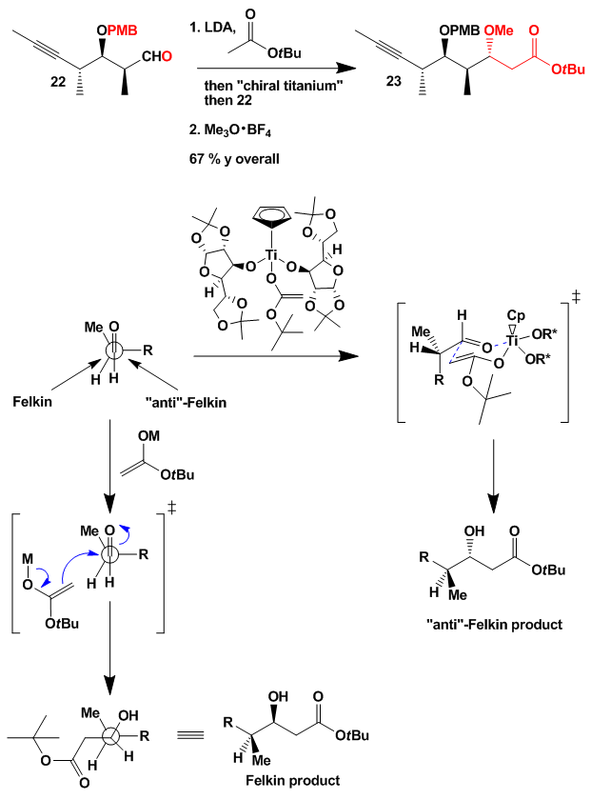 The second fragment was formed among others by a Marshall reaction and an underrepresented Duthaler-Hafner acetate aldol reaction. 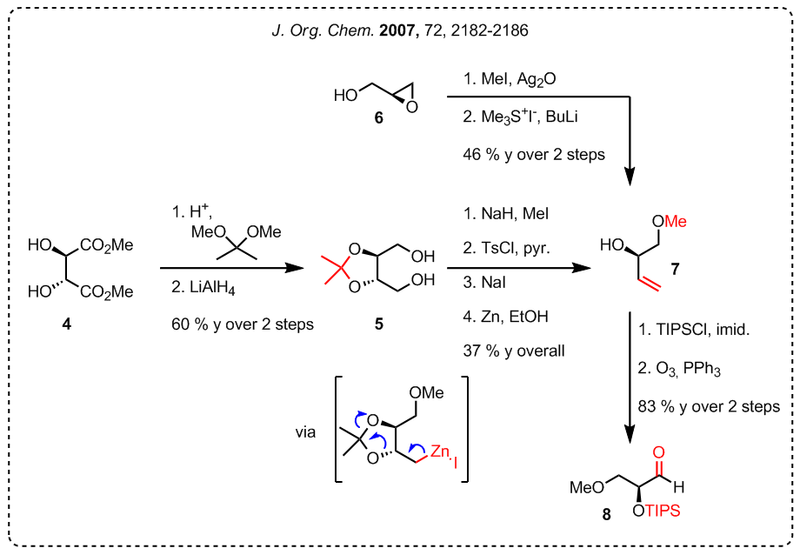 Starting from commercially available lactic acid 3 which was transformed into triflate 4 in a four step sequence through acetylation, ester formation, deacetylation, and triflate formation a zinc mediated SN2 coupling of triflate 4 with homoallyl Grignard formed ester 5. 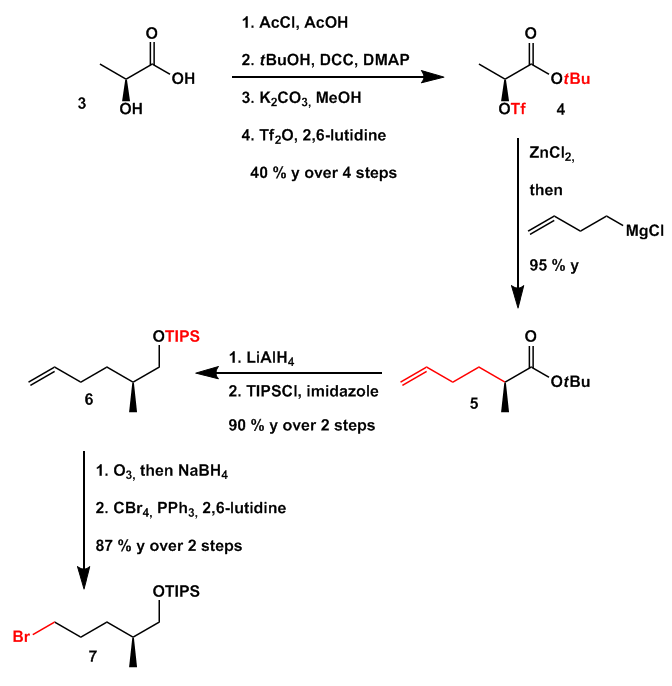 Thorough reduction of the ester group furnished after TIPS protection silyl ether 6. 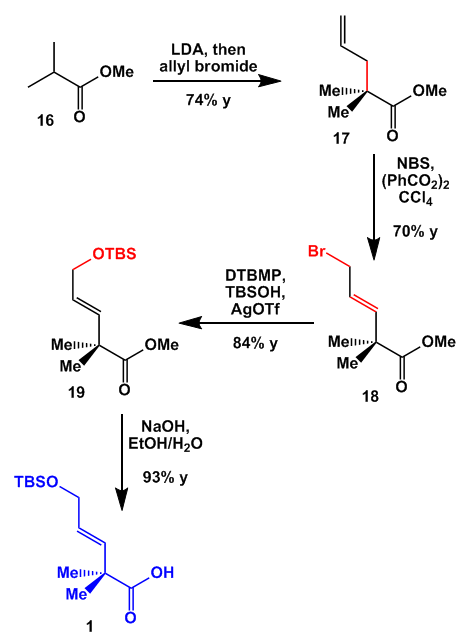 Ozonolysis of the terminal double bond was followed by reductive work-up and Appel reaction to give bromide 7. 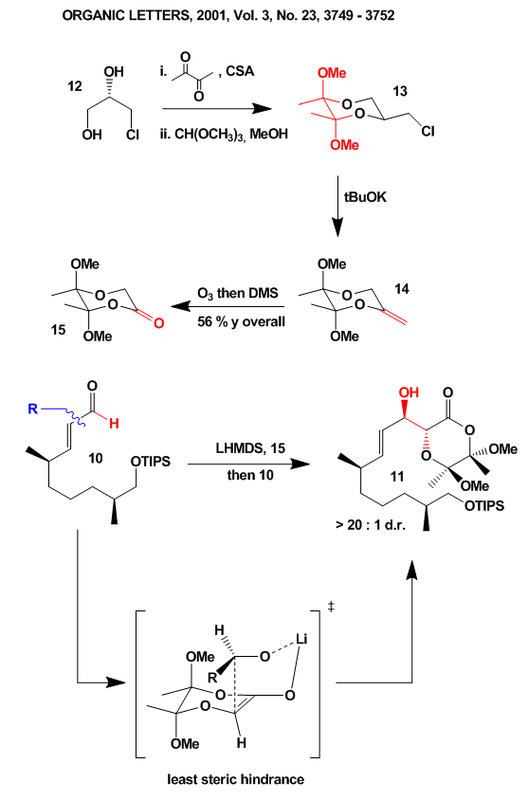 After reduction and manganese dioxide oxidation to aldehyde 10 the above mentioned Ley aldol reaction with ester 15 was employed. 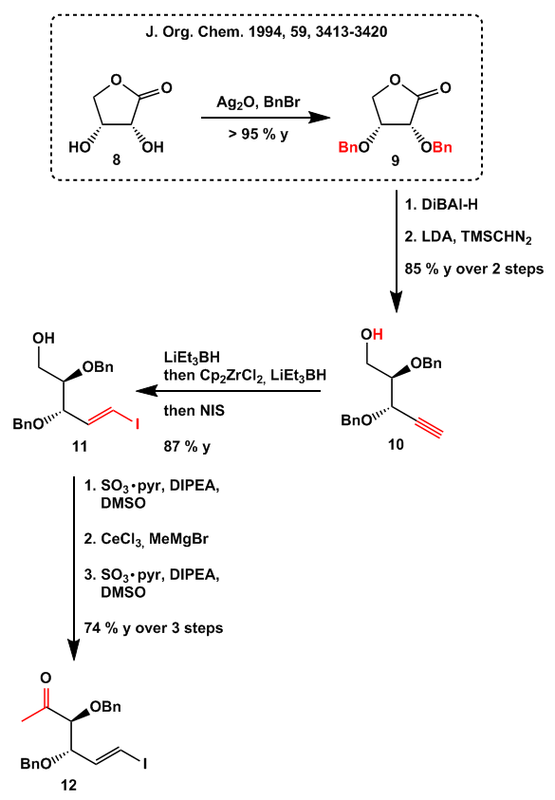 Aldol product 11 was obtained in good yield and excellent diastereoselectivity. 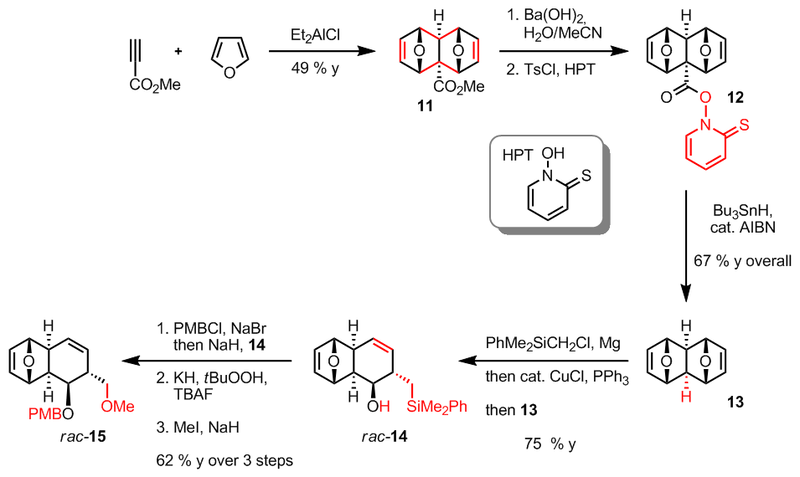 Fragment 15 can easily be prepared through a three step sequence which is shown in detail below. 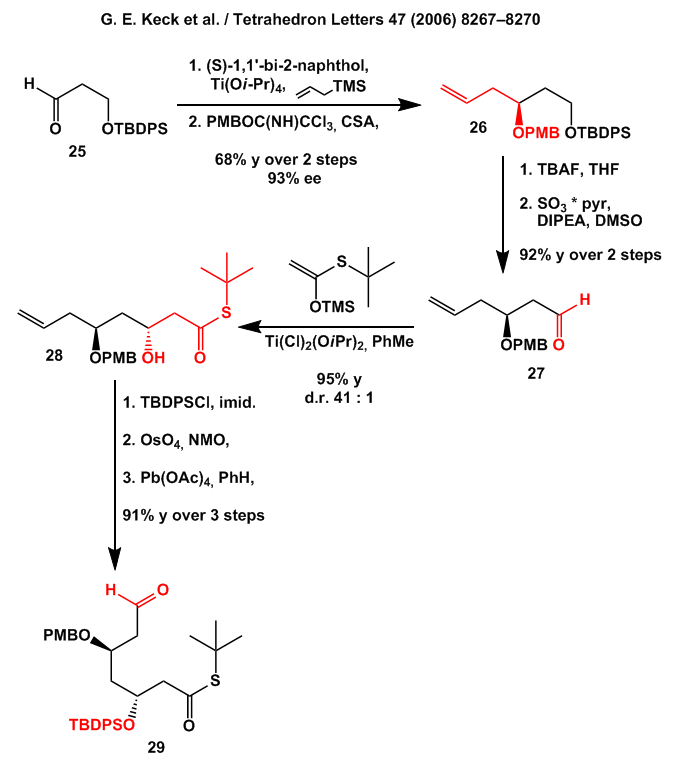 Commercially available diol 12 was first protected as the dioxane ether 13. 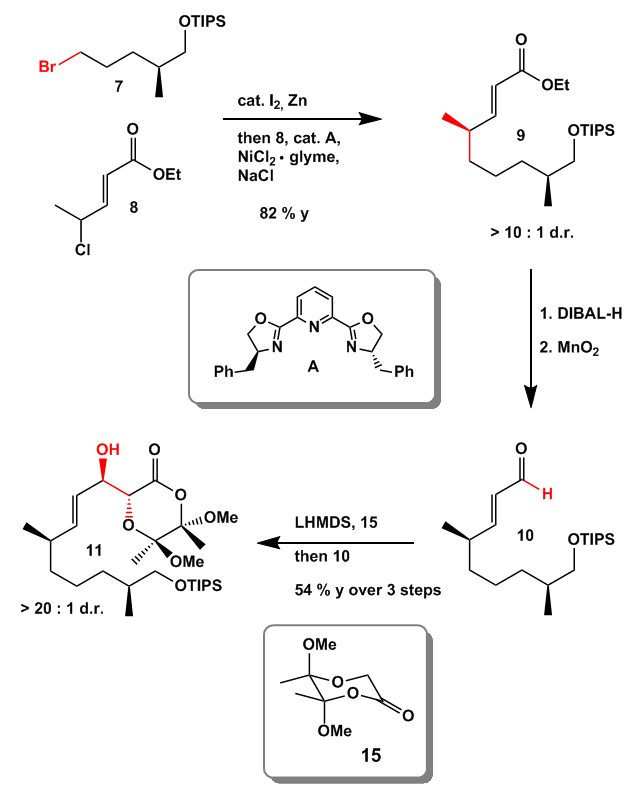 The 1,2-dimethoxy protecting group is used as a chiral memory unit because the stereochemical information at position 2 is lost during enolization. 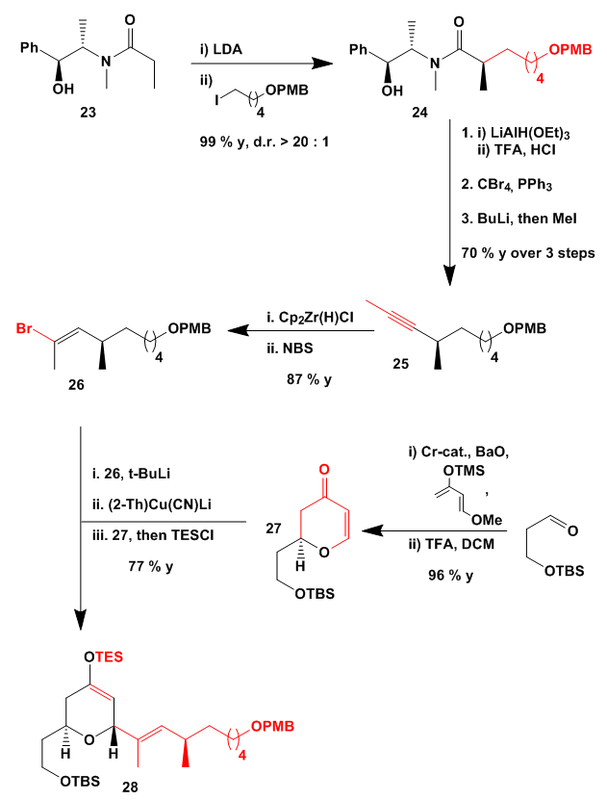 Chloride elimination and Ozonolysis of the resulting double bond gave after neutral workup ester 15. 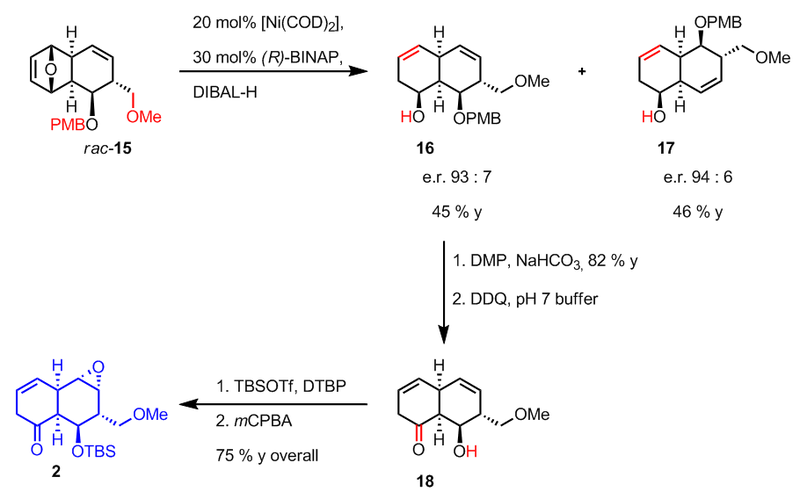 Enolization with LHMDS then produces an enolate which reacts in a Zimmermann-Traxler boat conformation transition state with aldehyde 10. 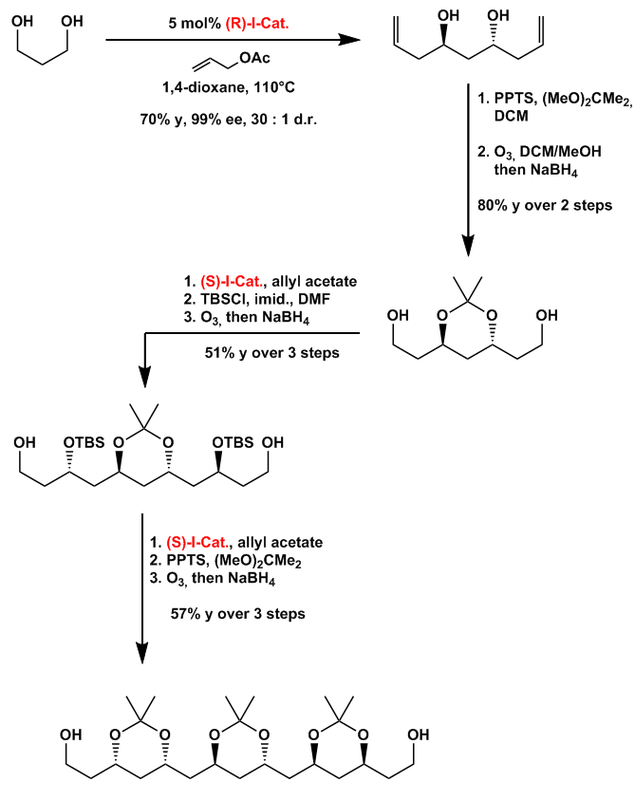 The whole story of this methodology can be looked up in the article which is cited above. 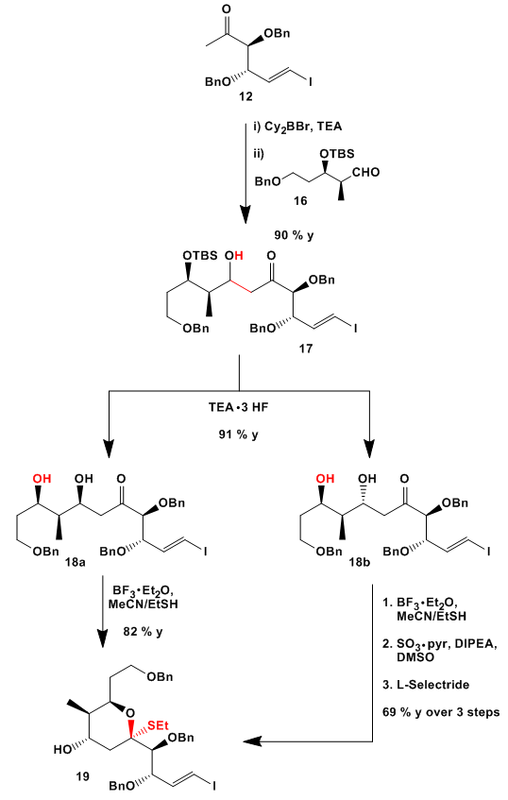 The second half of the synthesis started from propargyl alcohol 16. 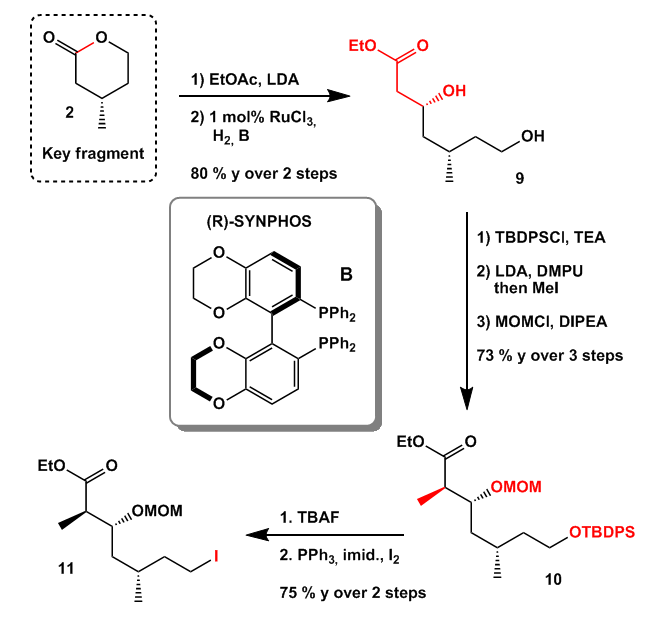 Oxidation and hydride-transfer reduction with isopropanol catalyzed by Noyori’s catalyst gave enantiomerically pure alcohol 17. 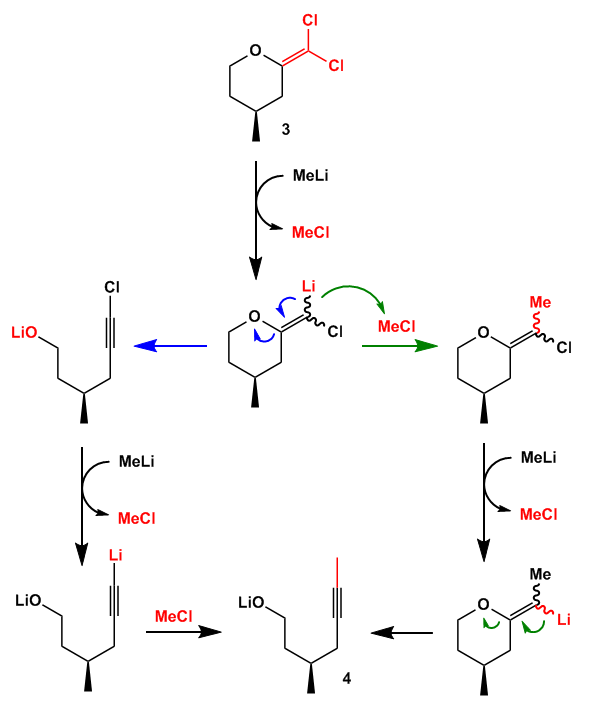 Mesylation formed the first partner for the Marshall reaction. 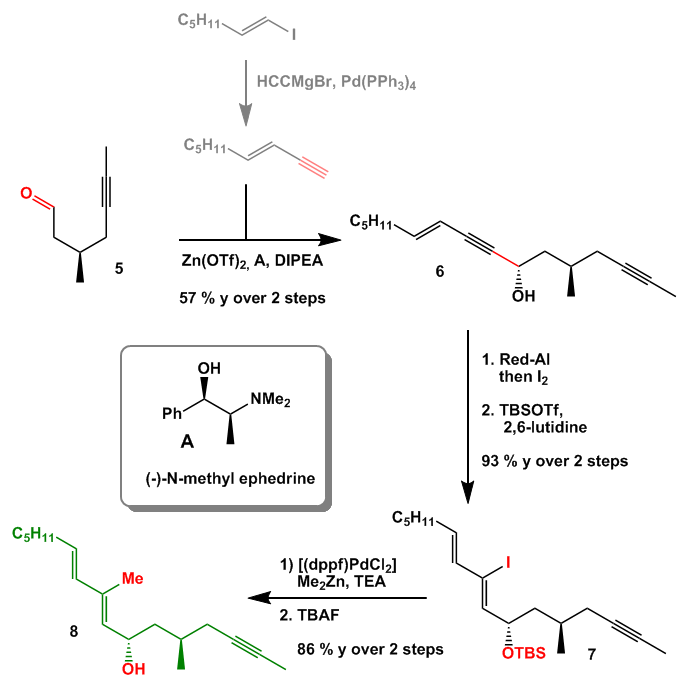 The aldehyde partner was obtained from Roche ester 19 which was protected, excessively reduced and again oxidized. 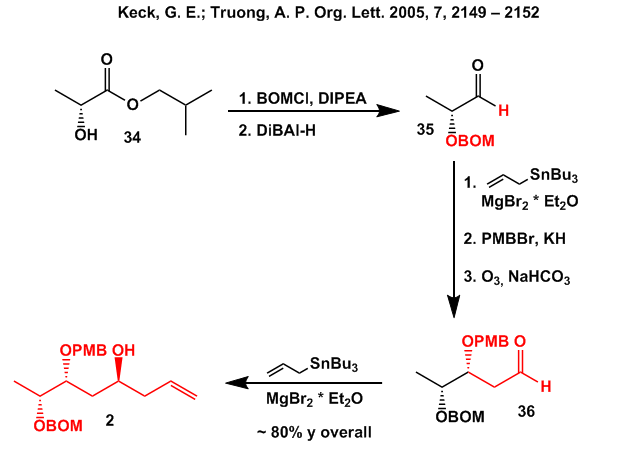 Next an anti-selective Marshall reaction mediated by indium(I)iodide and catalyzed by Pd(0) was used to give homo-propargyl alcohol 21. 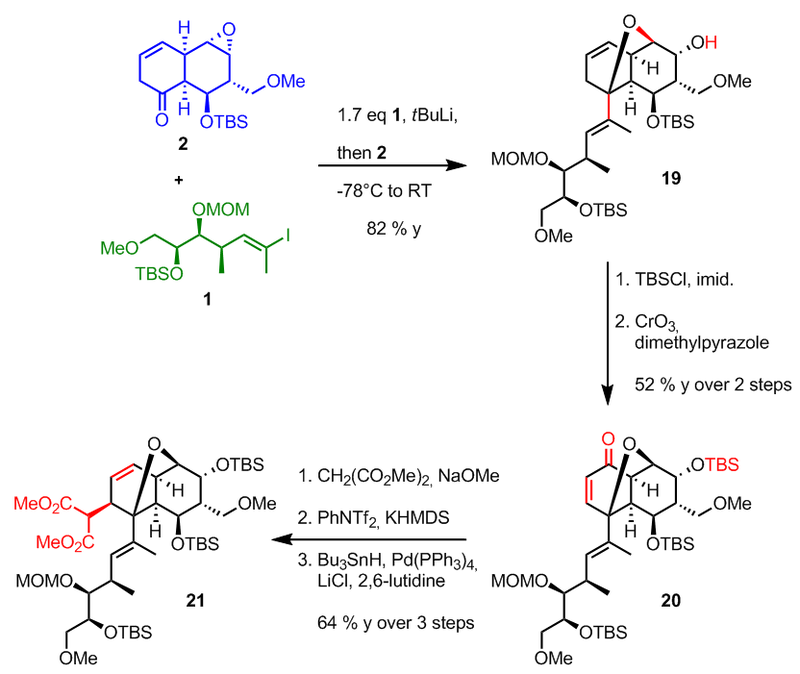 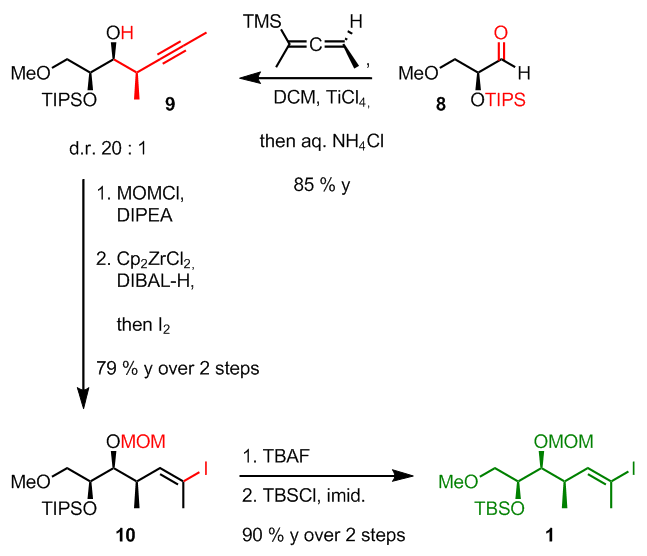 Desilylation with TBAF, acetal formation and chemoselective reduction then furnished after Swern oxidation aldehyde 22. 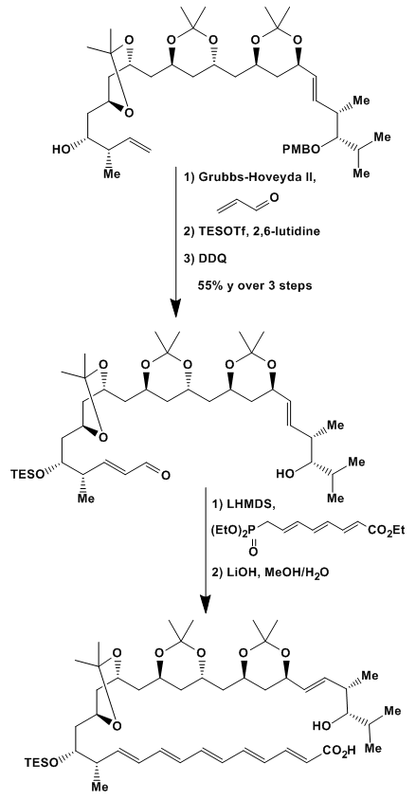 This underwent another interesting reaction: a Duthaler-Hafner titanium mediated aldol reaction with t-butylacetate. 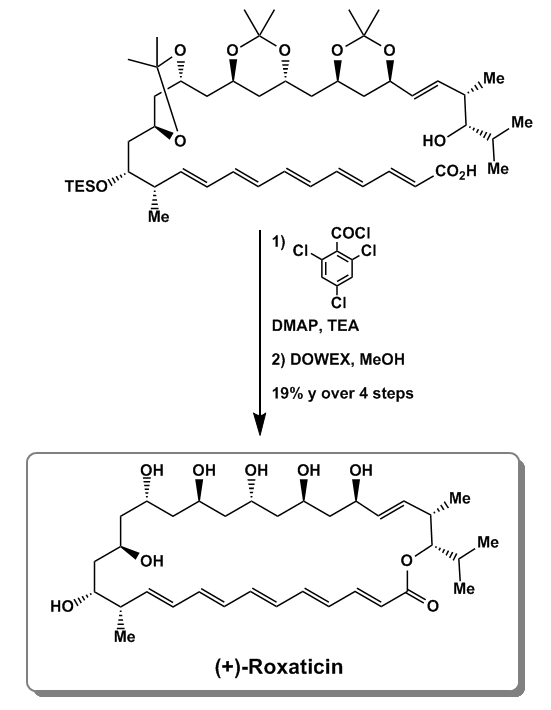 This step will be detailed at the end of this post. 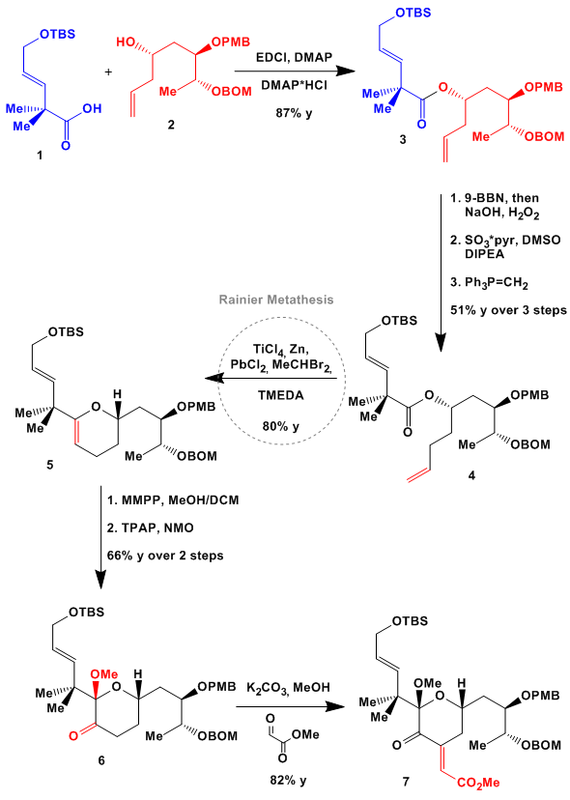 After reaction with Meerwein’s salt fragment 2 was almost ready for the Nozaki-Hiyama-Kishi reaction. 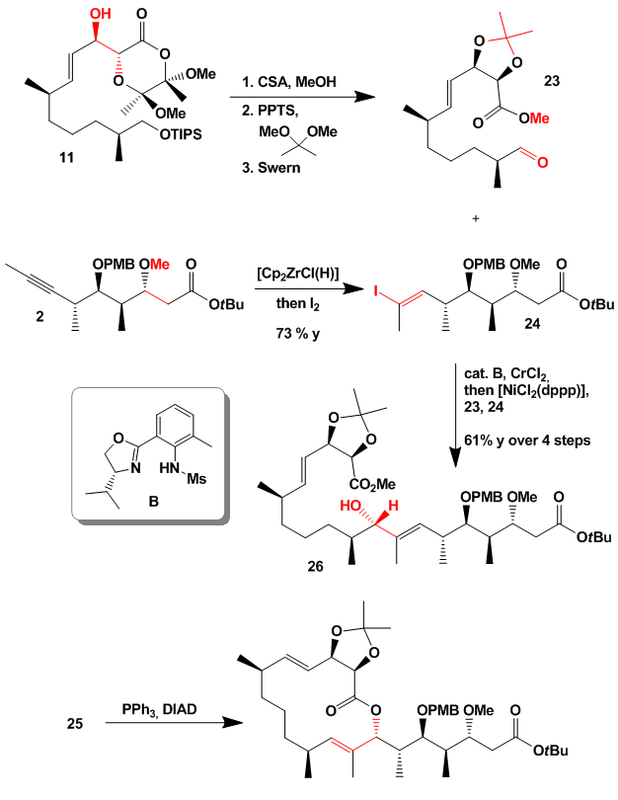 First fragment 11 was freed from the chiral memory unit and the resulting diol protected as the acetonide. 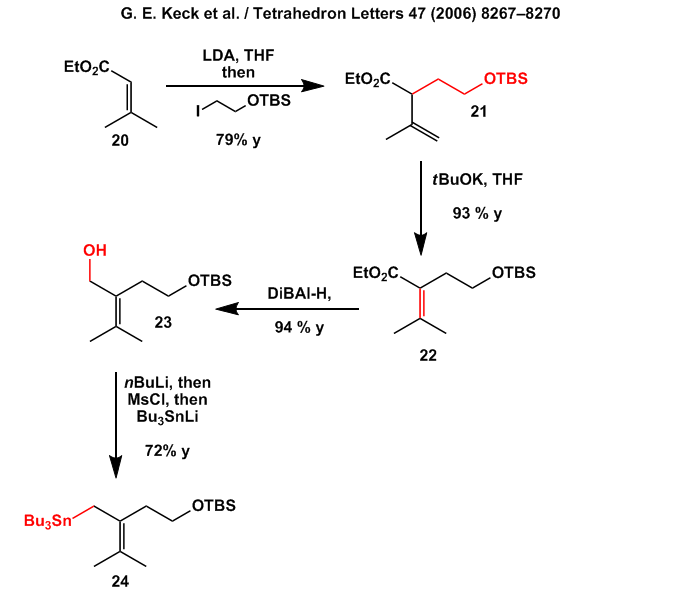 During protection the TIPS group was lost and the free alcohol then oxidized to give aldehyde 23. 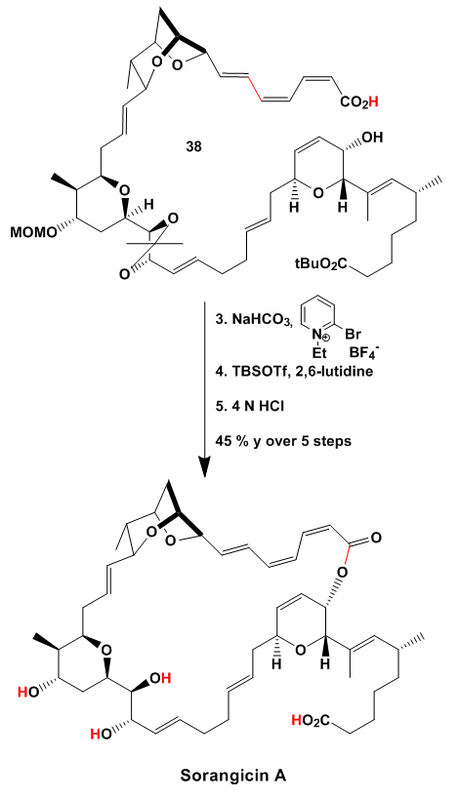 On the other hand fragment 2 was exposed to Schwartz’s reagent and quenched with iodine to give vinyl iodide 24. 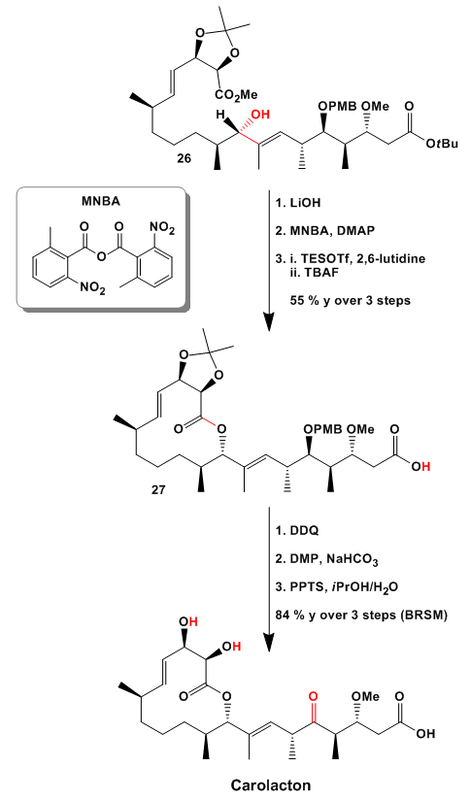 In the presence of Cr(II), in situ formed Ni(0), and ligand B both halves were combined to give 25 and 26 as a mixture of diastereomers (~ 1 : 5). 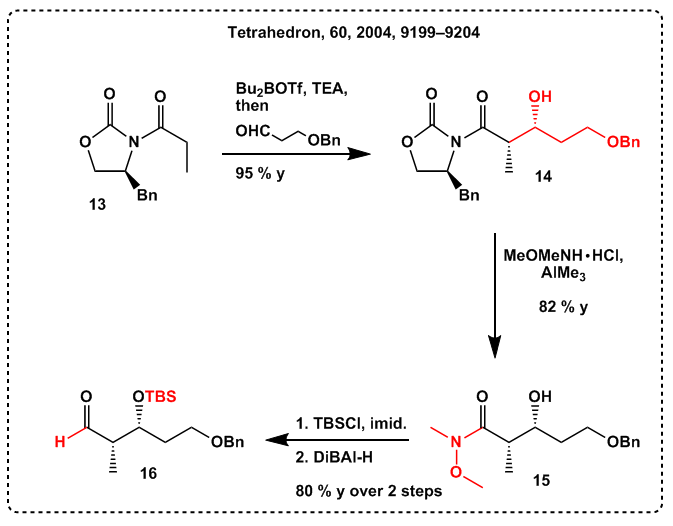 Besides carrying the synthesis on with 26, it was tried using the wrong diastereomer 25 in a Mitsunobu process to close the macrolactone. 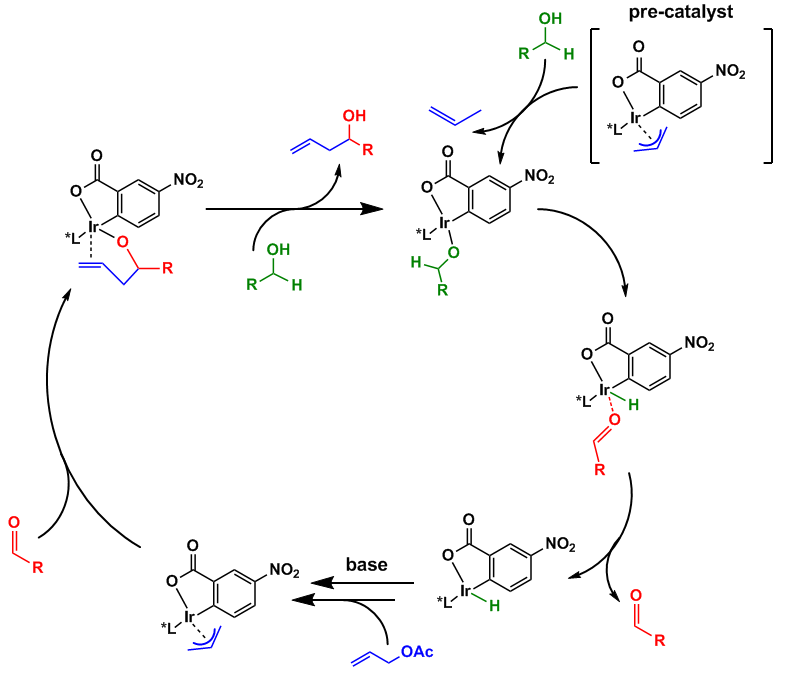 Instead of closing the ring a SN2’ reaction was observed to give the vinylogous macrolactone. 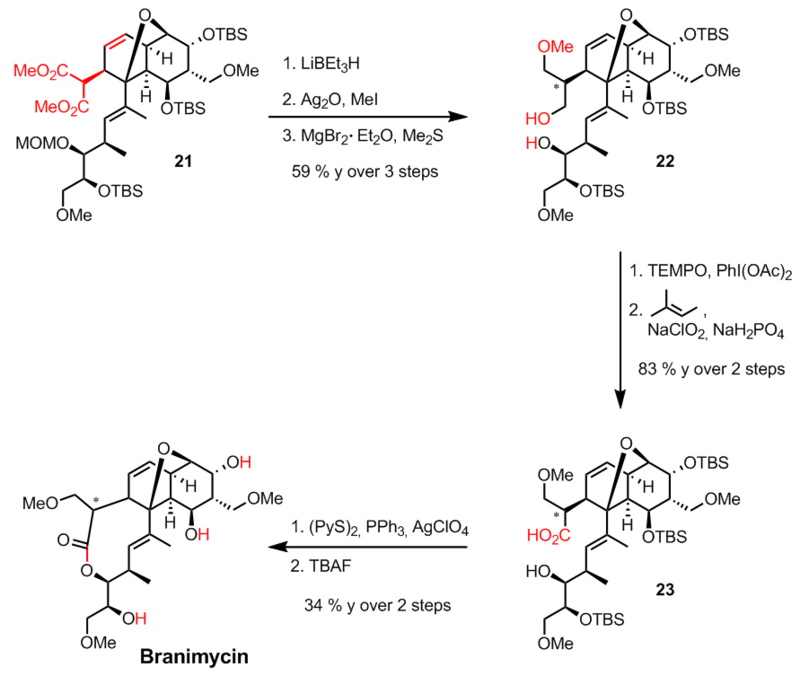 Nice work and worth a read. 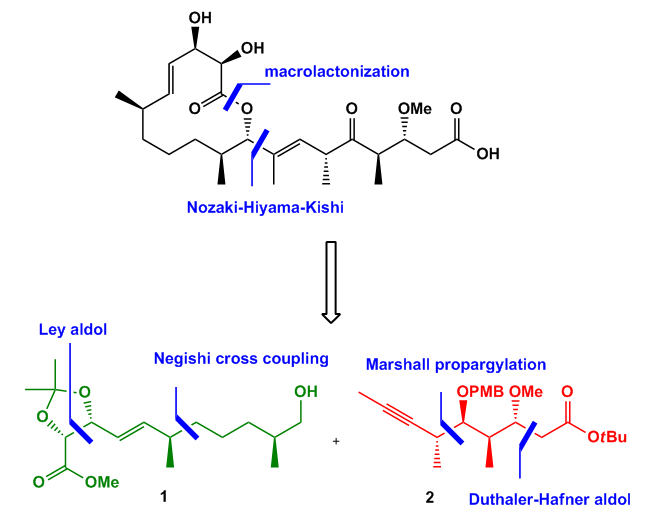 Interestingly the Negishi cross coupling can be conducted employing a racemic mixture of the chloride. 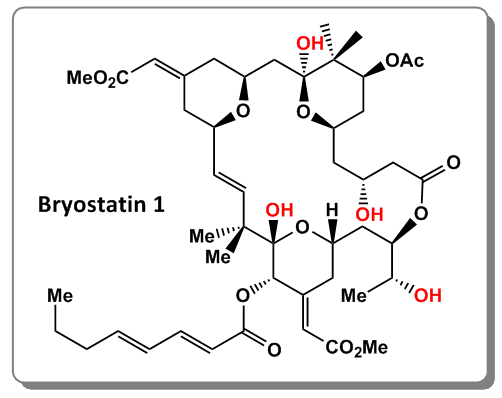 Only one diastereomer is formed. 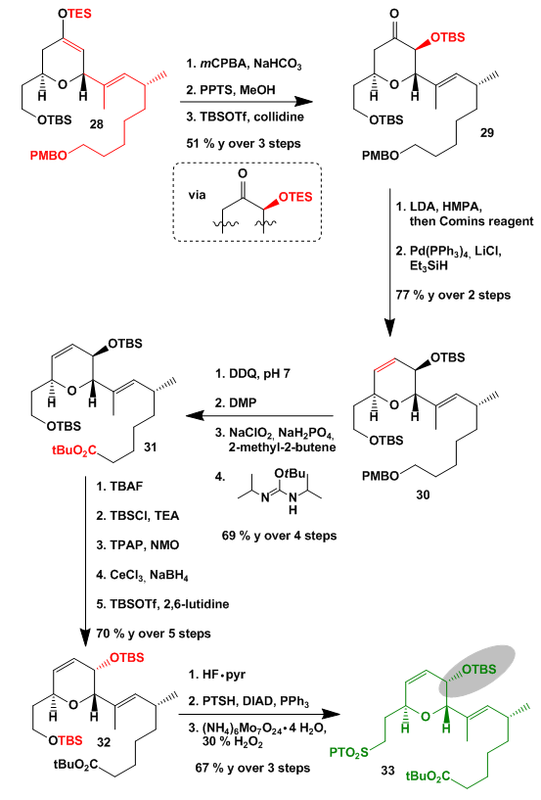 The authors of this article (DOI: http://dx.doio.org/10.1039/B805648J) therefore propose a radical pathway. 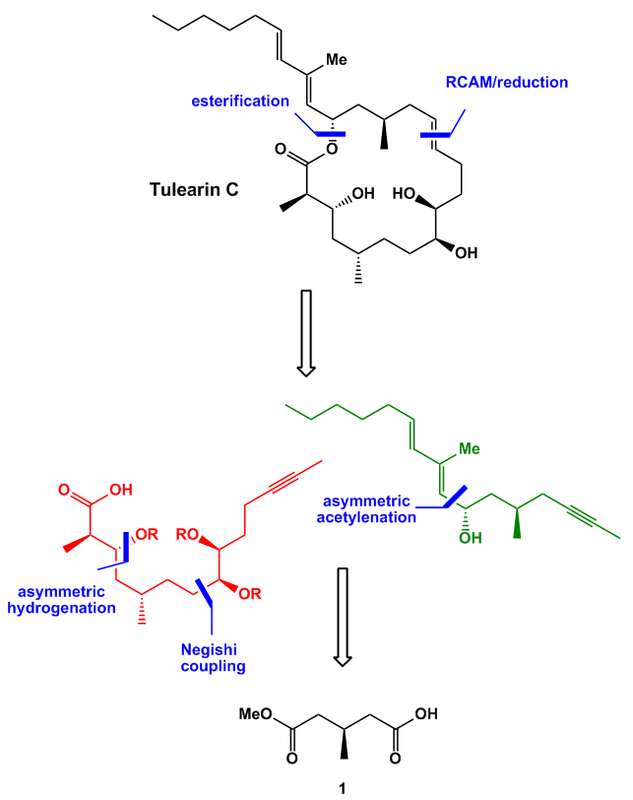 Because the paper did not state exactly how the stereochemistry observed can be explained I tried it by myself. 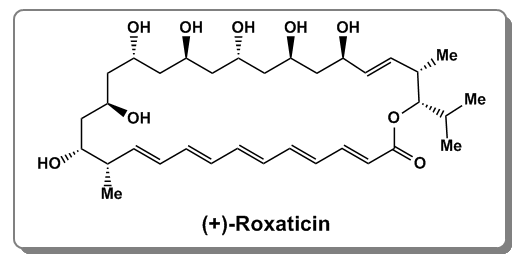 If anyone has a better explanation I really would like to hear it.